In both everyday driving and off-road conditions, the New Audi Q7 doesn't compromise on performance. Whether you're managing a family or exploring the great outdoors, the New Audi Q7 allows you to roll through any environment with confidence. The muscular shape features a dominant 3D-hexagonal single-frame grille, a beautifully curving wraparound tailgate, and a full body paint finish. Additional styling is available with the optional S Line trim, which features 20-inch alloy wheels, all-weather LED headlights and a distinctive front bumper and side skirts. The welcoming interior features ergonomic seating, upholstered in a choice of Twin leather, Valcona leather or leather/Alcantara. An optional leather package also extends to the centre console and armrests, or for an even richer experience, the S line interior features brushed aluminium inlays and an S line 3-spoke leather-trimmed multi-function steering wheel with gear shift paddles. When it comes to interior technology, the rugged New Audi Q7 does not disappoint. The 10-speaker Audi sound system lines the cabin space providing crystal-clear sound, and an HDD satellite navigation system forms the centre-piece of the driver's zone. Audi Virtual Cockpit is available as an option and replaces the traditional dashboard with a high resolution 12.3" LCD screen, ensuring everything you need to know is right in front of you. A powerful car demands a powerful engine, and the New Audi Q7 boasts a 272PS 3.0-litre TDI, capable of 0-62mph in just 6.5 seconds. This engine provides refreshingly low CO2 emissions, just 153g/km, and incorporates a host of technology to minimise fuel consumption. 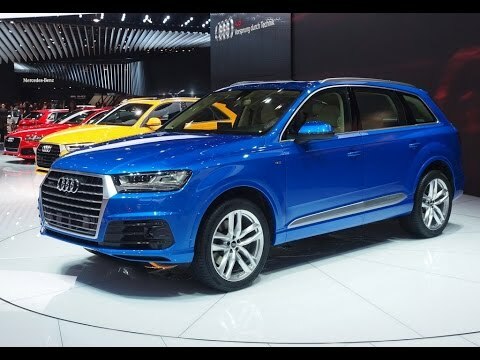 Further reducing consumption, the Q7 is now also available in a 218PS version of the advanced 3.0-litre TDI engine which can accelerate from 0 to 62mph in 7.3 seconds with CO2 emissions of 150g/km. What's more, the New Audi Q7 is proud to call itself one of the safest cars on the road. That's thanks to intelligent Sideguard airbags, high-performance brakes with ABS, and Audi's full range of Electronic Stability Control (ESC) safeguards. The high strength bodyshell shields the cockpit with extended crumple zones, and for younger passengers ISOFIX child safety seat anchors are fitted as standard. Buy Or Lease A Brand New Audi Q7, Let UK Car Broker Find You The New Audi Q7 Deal For You.